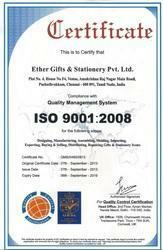 Our quality oriented approach has enabled us to maintain excellence in our entire business operations. We source wide assortment of corporate gift items from certified vendors, who make use of quality tested raw material in the manufacturing process. Our quality auditors remain vigilant at every stage whether procurement & packaging stages or dispatch of finished products so as to maintain our market reputation amidst our clients. At our quality testing unit, we check the sourced range on well-defined parameters to ensure flawless products. Abiding by our quality control measures, we have become the preferred choice of our valued customers spread across the country. We have directed all our efforts towards attaining 100% client satisfaction. With our association with reputed vendors, we have been offering immaculate range of corporate gift items to our esteemed clients. Our enchanting corporate gift items are widely preferred by our customers due to exquisite designs and aesthetic appearance. Moreover, due to our fair business practices, easy payment modes, reasonable pricing and on-time delivery of consignment, we have created a prestigious clientele across the country. 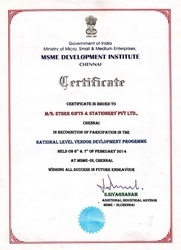 We are MSME Certificate based company.